In sheet metal forming processes, formation without fracture is related to sheet metal formability. Parameters such as tool geometry, blank holder force, and lubricant are changed in order to push the formability of material to its maximum capacity. Lubricants play an important role in sheet metal forming processes. Depending on the type of lubricant, the formability of the sheet metal can be increased, the surface quality of the product can be improved, and the tool life can be extended. In this study, nanoparticles were added to solid lubricants, and the effect of nanolubricants on sheet metal formability was investigated with Erichsen test. Test specimens were observed by SEM, and the nanoparticle effect was investigated by EDX mapping. In addition, the optimum nanoparticle concentration was determined, and the effects of the nanoparticle on solid lubricants were compared with other lubricants which were used in sheet metal forming. As a result of the study, it was observed that the nanoparticle additive increased the formability by 13%. Results showed that the formability of the sheet metal increased up to certain nanoparticle concentrations, but it decreased above this limit. Sheet metal forming processes such as deep drawing, spinning, and hydroforming are the preferred methods for producing sheet metal products for reasons such as high efficiency, low cost, standard tolerances, and mass production. The quality of the products manufactured by these methods is directly affected by the type of lubrication and lubricant. In addition, lubricants affect the formability of sheet metal and the fracture that occurs during forming [1, 2]. Lubricants used in sheet metal forming processes play an important role in reducing friction, prolonging tool life by reducing wear, increasing the surface quality of the product and increasing formability of sheet metal. Therefore, the determination and improvement of lubrication properties of lubricants are important for the future of sheet metal forming processes. There are many studies in the literature on lubricants used in forming processes. Mosleh et al. examined the tribological properties of forming fluid by adding different nanoparticles such as MoS2, WS2, and hBN at different ratios . They determined that nanoparticles of 50–100 nm in size exhibited significant resistance to wear. They also showed that the nanoparticle concentration increased the rate of wear when it exceeded a certain limit. In another study, Zareh-Desari and Davoodi added CuO and SiO2 nanoparticles to soy and canola oils and examined the effect of these oils on forming processes by performing a standard ring compression test . They observed that the SiO2-added vegetable oil reduced friction. They also showed that the total amount of energy consumed decreased in the forming process using the nanoparticle-added oil. Li et al. conducted an extensive literature review on the friction that occurs in sheet metal forming processes and the factors of friction. In this study, it was emphasized again that the lubricant was an effective factor in reducing the heat and friction generated during the forming process. The interactions of nanoparticle-added lubricants (nanolubricants) with the surface during lubrication and the change in lubricant performance have been studied by many researchers. On this subject, Gulzar et al. prepared a large-scale literature review that examined the tribological properties of nanoparticles added to lubricants. In this review, the effect of nanoparticles on lubricity was revealed by four different lubrication mechanisms such as a ball bearing effect [6, 7, 8], protective film formation [9, 10, 11], mending effect , and polishing effect . In the literature, various tests have been used to determine the properties and effects of lubricants used in forming processes. Cora et al. conducted a sliding friction test to determine the friction characteristics of coatings on molds. Herrmann et al. 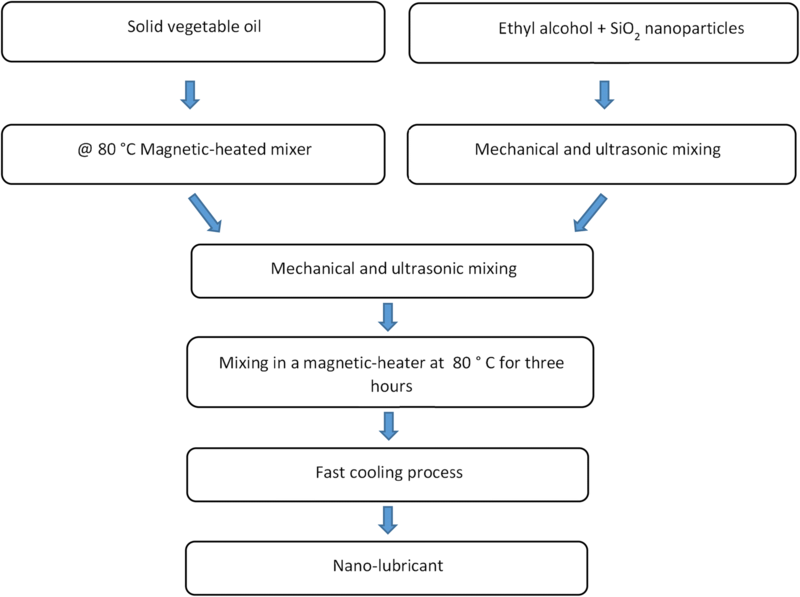 determined the cooling and lubrication properties of vegetable oils using the grinding test. Abdullah et al. determined the properties of nanoparticle-added lubricants under high pressure using the four-ball method. 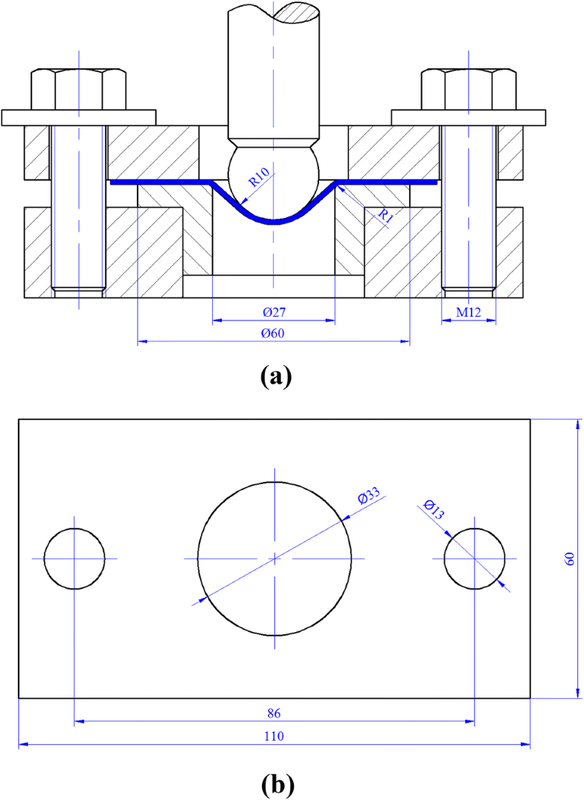 In addition, methods such as ring compression [17, 18] and pin on disk [5, 19] were used to determine the friction coefficient and lubricant effect in forming processes. In sheet metal forming processes, tests such as the deep drawing test, Erichsen test, and Nakazima test were generally carried out under lubricated and dry conditions, and the effect of lubricants on the formability of sheet metal was investigated [9, 10, 11, 12]. Although there were many studies in the literature on nanoparticle-added lubricants and the processes used for these lubricants, a few studies can be found that examine the effects of nanoparticle-added lubricants on sheet metal forming processes. In this study, the effect of silicon dioxide (SiO2) nanoparticles on the sheet metal forming process when added to vegetable solid lubricant was investigated. In the first stage, the solid lubricant is melted, and SiO2 nanoparticles are added and cooled. This lubricant was then applied to the sheet metal sample surfaces, and the sheet metal samples were subjected to the Erichsen test. Then, the best nanoparticle concentration was determined by comparing the deformation depths obtained from the experiment. In addition, the commercial lubricants used in the market were compared with the nanolubricant to find out which one reached the highest deformation depth. The surfaces of the samples subjected to the Erichsen test were imaged by SEM and analyzed for base lubricant and nanoparticle residues by EDX analysis. In the tests, DC01 low-carbon cold-rolled steel sheet, which is commonly used in deep drawing processes, was examined for its formability with base lubricant, nanolubricant, and in dry conditions. The mechanical and surface properties of the used steel sheet are given in Table 1. The Erichsen test is a simple and fast method that is often used to determine and compare sheet metal formability. In this method, the sheet metal is clamped between the blank holder and the die is stretched with a spherical punch until a fracture occurs. The maximum dome height obtained before the fracture is considered a measure of formability. The dome height could vary depending on the blank holder force (BHF) and the lubrication condition. The Erichsen test setup used in this study had a loading capacity of 20 kN. Figure 1 shows the dimensions of the die set used in this test. The sheet metal with 60 × 60 mm2 dimensions was clamped between the blank holder, and the die and the BHF were applied with bolts. In all experiments, the bolts were tightened using a torque meter with a torque of 50 Nm to apply the same BHF. Since the BHF was sufficient, the sample measurements did not change at the end of the test. The lubricants used in the tests were applied only to the surface of the punch and to the surface of the sheet metal in contact with the punch, and no lubricant was applied to the sheet metal surfaces between the die and the blank holder. The punch speed was set at 0.5 mm/s. The applied punch force and deformation depth were measured instantaneously and recorded with a data logger. In addition, the fracture or necking that occurred during the test was instantaneously observed with a mirror in the test setup. All tests were repeated at least three times, and the results were evaluated. The formability of the sheet metal used in forming processes and the surface quality of the produced product have significant importance . In order to improve the surface quality of products, the most commonly used method is to apply lubricants on the part and die sets. This method also helps reduce costs by extending the tool life. However, the lubricants used in the market have some disadvantages such as high cost, difficult cleaning, and being dangerous for health. It is ensured that vegetable fat can be comfortably applied on sheet metal surfaces. Vegetable fat is easier to clean than other mineral or synthetic oils. Vegetable fat residues are not a threat to human health and environmental pollution . Vegetable fat is considerably cheaper than other oils used in sheet metal forming processes, and this helps reduce the costs of the products. Inexpensive and easily accessible vegetable oil can be converted into a high added value product. Eighty-two percent of vegetable fats consist of sunflower oil, soybean oil, cottonseed oil, canola oil, and palm oil at different rates, while the remaining 18% is composed of milk, milk proteins, water, and other additives. Physical properties of vegetable oils and fatty acid components are given in Table 2. It is desirable that the lubricants designed for use in sheet metal forming operations are inexpensive. SiO2 is abundant in nature, and it is one of the cheapest nanoparticles . The surface energies of the nanoparticles are high; so they are not easily mixed as in normal solid–liquid mixtures when mixed in fluids. For this reason, certain methods are used to mix the nanoparticles in the fluid. From this point of view, SiO2 nanoparticles are among the most dispersible ones in fluids . Many studies on nanoparticle-added lubricants showed that SiO2 nanoparticles improve the tribological properties of the base oil [1, 16, 17, 18]. The flowchart of the prepared nanolubricants is given in Fig. 2. It is difficult to distribute the SiO2 nanoparticles directly and homogeneously in the oil. Two different methods are found in the literature . In the one-step method, nanoparticles are produced directly in the fluid. In the two-step method, the produced nanoparticles are directly mixed into the fluid, and then, ultrasonic mixing and addition of surfactants are carried out to obtain a homogeneous mixture. In this study, the two-step method was used to produce nanolubricants. Vegetable fat, as the base lubricant, was liquidized at 80 °C using a magnetic-heated mixer. The viscosity of the base lubricant was high. The base lubricant was diluted with ethyl alcohol to facilitate the mixing of nanoparticles in the base lubricant and to increase the efficiency of the ultrasonic mixer. First, SiO2 nanoparticles were mixed with ethyl alcohol mechanically and ultrasonically. The resulting homogeneous mixture of SiO2/ethyl alcohol was added to the base flow at 80 °C. Then, mechanical and ultrasonic mixing operations were applied to the mixture. Finally, the mixture was stirred with a magnetic stirrer at 80 °C for 3 h to completely remove the ethyl alcohol from the mixture. Considering previous researches, it is seen that the tribological properties of nanoparticle-added lubricants depend on nanoparticle size, concentration, shape, and oil stability . 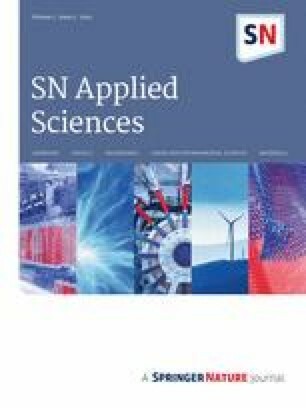 In this study, 30–40 nm spherical SiO2 nanoparticles were obtained from the market. The amounts of nanoparticles in the nanolubricants were determined by preliminary experiments. As a result of these experiments, the mass nanoparticle ratios were determined as 1, 3, 5, 7.5, and 10 wt%. 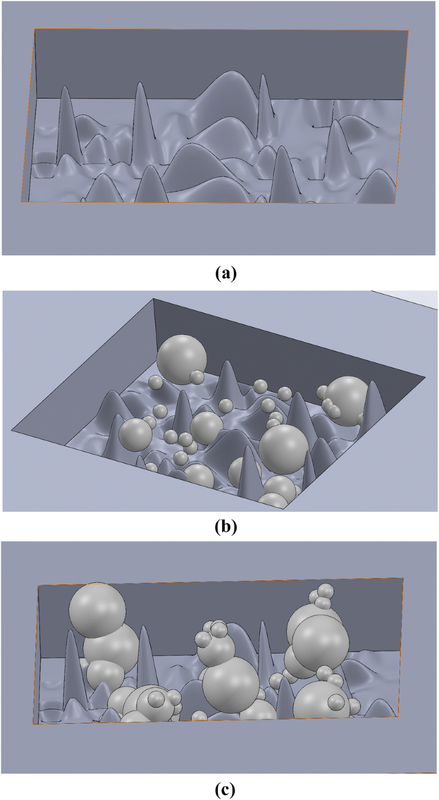 The deformation depths obtained from the Erichsen test based on the nanoparticle additive ratio are given in Fig. 3. Nanoparticle additions of 1, 3, 5, 7.5, and 10 wt% in the lubricant increased deformation depths by 4.72%, 9.34%, 11.01%, 12.67%, and 10.31%, respectively. The deformation depth values obtained from the experiments with base lubricant were considered as references while these ratios were calculated. The maximum increase in deformation depth was obtained in 7.5 wt% SiO2-added lubricant. 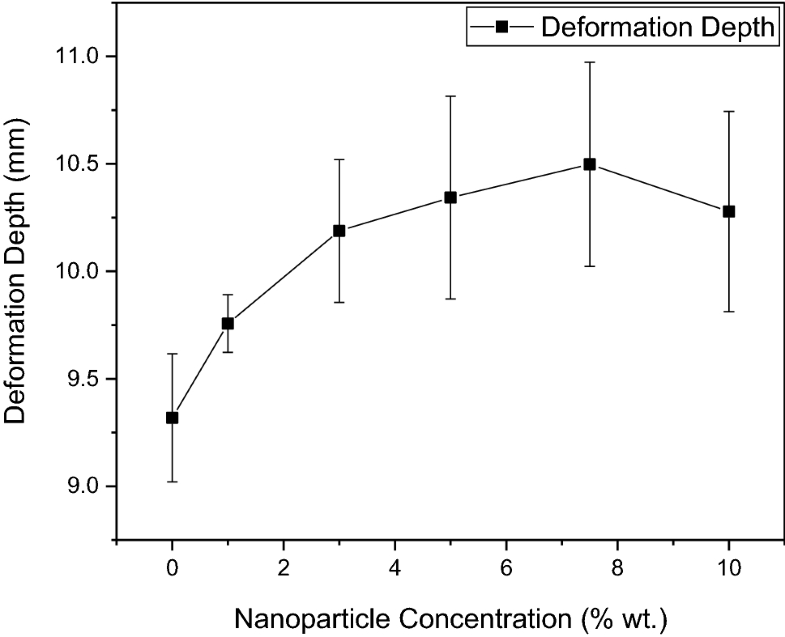 It was observed that the deformation depth started to decrease as the nanoparticle additive ratio was increased over 7.5 wt%. The formability of the steel sheet tested with nanolubricant showed a remarkable increase. In order to better understand the contribution of this increase to the forming process, it must be compared with the deep drawing oils already used in the industry. Three different deep drawing lubricants, which are frequently used in the industry, were determined for comparison. These lubricants were listed as Oil1, Oil2, and Oil3. 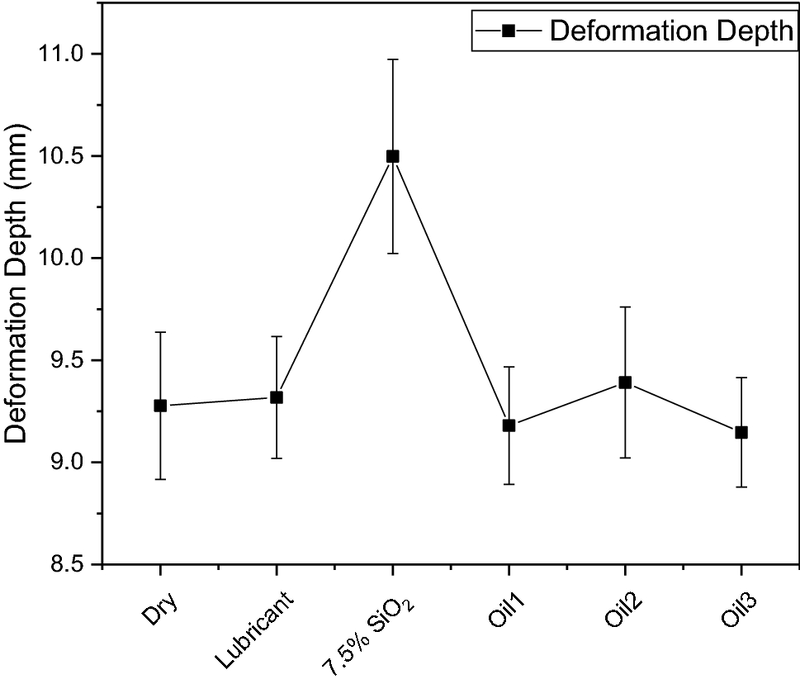 Figure 4 shows the deformation depths of tests using dry conditions (oil-free), base lubricant, nanolubricant, and three different deep drawing oils. Tests using base lubricant showed a limited increase in the formability of the steel sheet. On the other hand, the commercial oils Oil1 and Oil3 did not affect formability, whereas Oil2 increased formability by 1.23% compared to dry conditions (oil-free). It was observed that the nanolubricant developed by the authors increased the formability by 13.16% compared to dry conditions. Figure 5a shows an Erichsen-tested sample using 7.5 wt% SiO2 nanolubricant. Although the punch contact surface of the sheet metal was lubricated before the test, it was observed that there was no visible lubricant layer on the punch contact surfaces after the test. The tearing occurred in the punch contact surface at the end of the test. Samples were taken from the areas where the tear occurred and their surfaces were examined with a scanning electron microscope (SEM). In the randomly selected regions, the surfaces contacting the punch (lighter gray) were distinguished from the traces of friction (Fig. 5b). On the other hand, there were darker gray areas on the sheet where the punch did not contact. When this region was analyzed with energy-dispersive X-ray (EDX) mapping, it was seen that the Si and O elements were dense in the darker gray region (Fig. 6a, b). In addition, the C element was also present in this region, as seen in Fig. 6c. This indicated the presence of oil in the region. Figure 7a shows an Erichsen-tested sample using 10 wt% SiO2 nanolubricant. In this sample, a randomly selected area close to the tearing was also analyzed with SEM. As mentioned before, the punch contact surface of the sheet metal was observed as lighter gray as in Fig. 7b. EDX mapping showed that Si elements in the specimen surface tested with 10 wt% nanolubricant were found to be denser compared to 7.5 wt% (Fig. 8a). In the darker gray area, C and O elements were observed to be dense because of the lubricant residue (Fig. 8b, c). In addition, the Fe element was seen in areas where there was no lubricant residue. This result was expected (Fig. 8d). 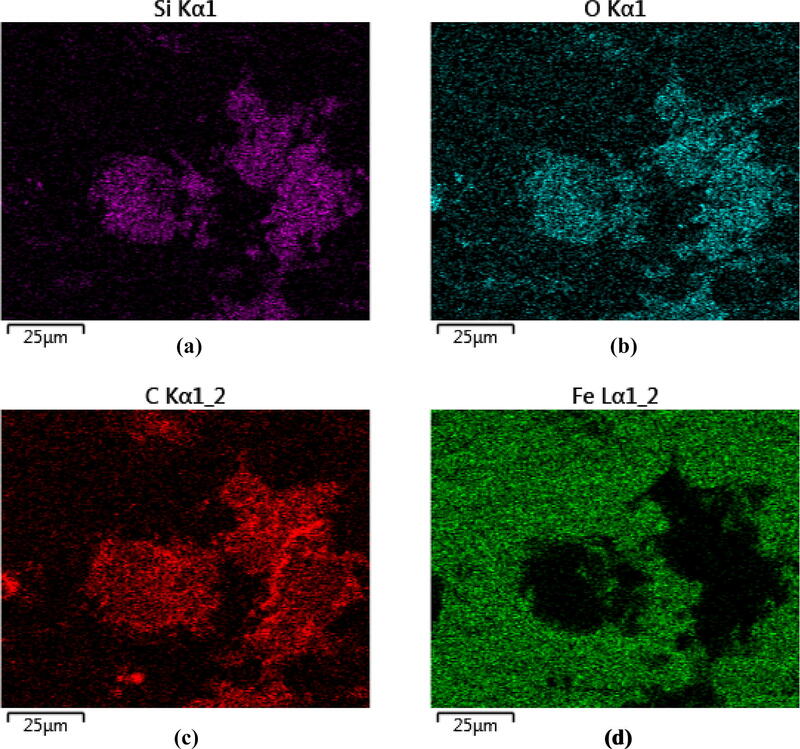 The presence of SiO2 nanoparticles on sheet metal surface was determined by EDX analysis at Figs. 6, 8. The nanoparticles, which are heavily present in the lighter gray regions, created two different situations. In the first situation, the nanoparticles filled the valleys on the sample surface and reduced the abrasion (Fig. 9a, b) . This mechanism is also known as the mending effect in the literature. In addition, the filling of the valleys with nanoparticles delayed the propagation of micro-cracks on the surface of the material . 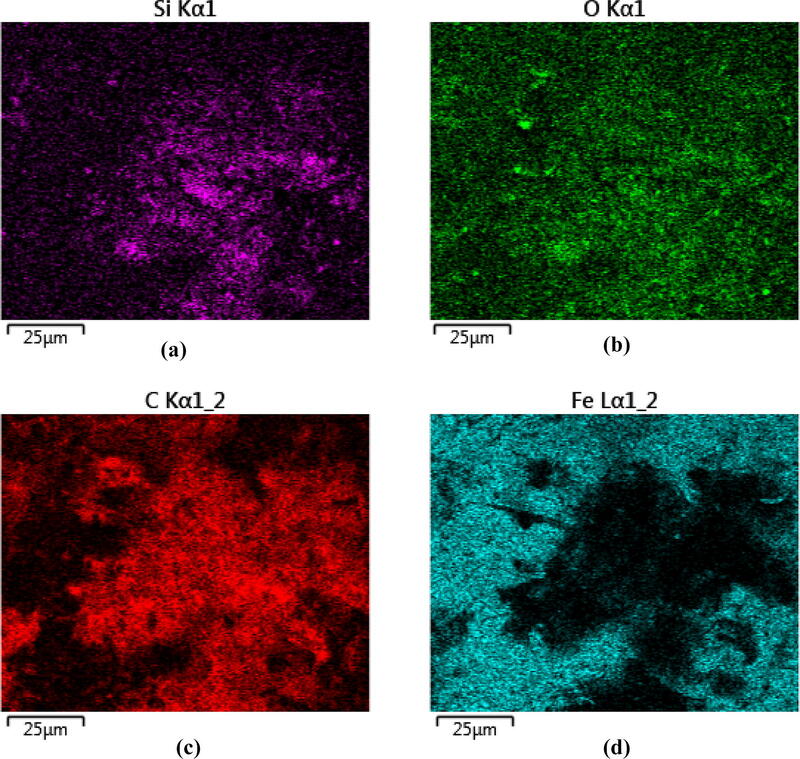 In the second situation, as the nanoparticle concentration in the lubricant exceeded a certain limit, the agglomeration was also increased (Fig. 9c). Some of these agglomerates can be larger than the asperities on the sheet metal surface. However, the agglomerates may also act as an abrasive and reduce the effectiveness of the nanolubricant. This explains the reduction in the formability of the sheet metal when the nanoparticle concentration in the lubricant was at 10 wt%. This study produced a lower-cost and better-performance lubricant than the commercial oils used in deep drawing processes in the industry. As the nanoparticle concentration in the lubricant increased, the formability also increased. However, as the nanoparticle concentration exceeded 7.5 wt%, the formability started to decrease. The best SiO2 nanoparticle concentration for DC01 steel sheet was 7.5 wt%. The formability of the sheet metal tested with nanolubricant increased by 13.16% compared to the specimen tested under dry conditions. Compared to the other oils used in the market, approximately a 12% increase was achieved in deformation depth with the SiO2 nanoparticle-added lubricant. In general, the significant improvement in the formability of the DC01 sheet metal in our study shows that nanolubricants can lead to better tribological properties during sheet metal forming processes. In further studies, the effect of different sizes and types of nanoparticle-added lubricants on the deep drawing can be examined. In addition, the effect of the nanolubricants on different types of sheet metals will also be worthy to be researched. This study was financially supported by Turkish Council of Higher Education under scholar grad: ÖYP-1919-018 and TUBITAK BIDEP 2211-A. Special thanks to Cumhur Sağlam, Mechanical Engineer of SAMPA Automotive, Samsun and Cüneyt Karaca, Mechanical Engineer of AYGÜN Surgical Instruments Co., Inc., Samsun, for their collaborations in this work.